Stephen Paddock, a 64-year-old man from Mesquite, Nevada, has been identified as the suspected gunman in the Las Vegas shooting. Police say he is dead. He had no known connection to terrorism, according to NBC News. At least 50 people died and more than 200 were injured in the attack near the Mandalay Bay hotel, police say. 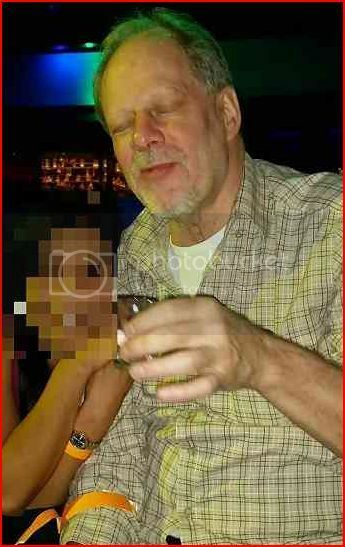 The suspected gunmen in the Las Vegas shooting has been identified as 64-year-old Stephen Paddock of Mesquite, Nevada. Police say they located him on the 32nd floor of the Mandalay Bay hotel and that he is dead. Police say he had no known connection to terrorism, according to NBC News. Over 50 people died and more than 200 were injured after Paddock opened fire at the Route 91 Harvest country music festival across the road from Mandalay Bay on the Las Vegas Strip. Las Vegas Metropolitan Police Department Sheriff Joseph Lombardo said the authorities have not completed an investigation into Paddock's background and history. But Lombardo said the police department had located a number of firearms in the room he occupied in the hotel. Officers will also be carrying out a search on Paddock's residence. It appeared the shooter fired on concertgoers from an upper-floor room at Mandalay Bay, the Las Vegas Review-Journal said. Investigators said they located a woman who had been traveling with Paddock, Marilou Danley, and want to question her. He has no known connection to terrorism and police have not called the shooting a terrorist attack, according to NBC. This wasn't a spur-of-the-moment act, he obviously had a bunch of ammo and mags up in that room. He planned to do this. And he wasn't planning to escape. He had a hunting license, he was a private pilot, and had a lawsuit against a casino years ago. They're now reporting that 58 are dead and "over 500 injured"
what did the guy use a belt fed? They are being careful not to say what he used.........YET. I am speculating he used high capacity drums. Muslim's are taking credit for it. Killer's Pilipino room mate/lover or whatever may have had something to do with it. Lots of radical Muslims in the southern Philippians. Any way you look at it, we can expect even more of our Constitutional rights to disappear. It's hard to tell from the videos I've seen, but it sounded more like an AK47 than one of the AR variants. There is a difference in the rate of fire. This is interesting. 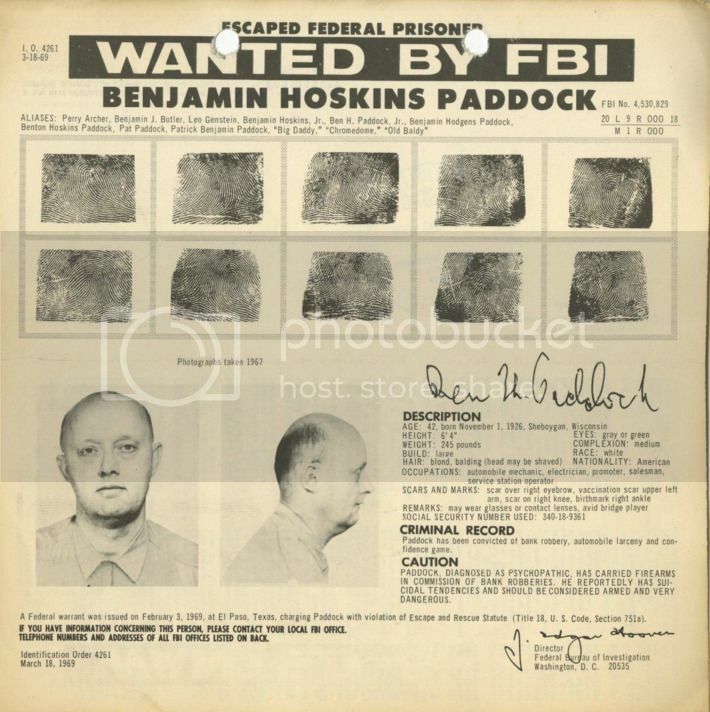 Stephen Paddock\'s father, Patrick ...le was on the FBI\'s "Most Wanted" list. The shooter was about seven years old at the time, so I doubt this was a real motivating factor. Still, it's interesting. The audio I just heard definitely sounds like a 'full auto'. The Las Vegas shooter didn�t commit suicide as the mainstream media is reporting, but was killed by a FBI hostage rescue team who also found Antifa literature in his hotel room, according to a source linked to the team. interesting. So pappy did time after being on the run. Junior joined Antifa after a mid-east excursion.The Mid East has been tied into funding Antifa. He didn't just "snap," like a couple reporters on Fox are speculating. He had to have planned this, you just don't bring that much ammo and that many weapons to a hotel room unless you have something in mind. And Fox News is reporting that he specifically asked for that particular room in the hotel. He has been planning this for a while. He seems to have been an avid poker player and casino gambler. I don't know how that factors in. I've been told there is a video of him at an anti-Trump rally. I haven't seen it, and I don't even know if it exists, but that is the only thing I've heard about his political leanings. You can do a lot of damage with 30-round mags, if you have enough of them. And if he can afford that many weapons and that much ammo and that hotel room, he could afford the mags. I have been at these casinos a lot when I was stationed at Irwin. Upper windows without balconies are supposed to be bolted shut. Either he or someone in his "Crew" defeated the window bolts.The more planning involved the more people involved. It seems he was recruited.Time will give us more details. The windows are bolted shut, but it wouldn't be too difficult to smash the window with a heavy hammer, or just shoot it out. I'm assuming that's what he did. Did anyone hear Savage today? There is speculation that this was a false flag with multiple shooters. And, one report says ISIS is claiming responsibility. I haven't heard savage today. and to the rest Oh Boy if the speculation is true it's going to be tough to unravel. He could have shot through the glass as well. We will probably never get to see the room photos. If inside the room it would muffle rifles report heard outside. Smoke detectors going off are what gave his position away. multiple shooters we will find out when the concert goers start to process the events in their minds. And Godspeed to the deceased. Sheriff is saying they are roommates and they found her gaming card in the hotel room he attacked from. Also reports of a woman yelling at concert goers telling them they will all be dead in 45 minutes. Curious to see if Danley matches that description of that woman. "was using high velocity assault rifles designed to penetrate body armour. They had been illegally converted into a machine gun". He further said that these kind of weapons can be converted to full auto by "changing the stock". CSC more info coming in. 10 rifles found inside room. Shooter evidently killed himself as police breeched the room; the shooter had video equipment set up to monitor LE approach. We need to ban guns now. The hildabeast says this wouldn't have happened if she had been elected because she would have banned "dangerous" weapons. And, the dems are screaming for gun control. I'm surprised it took them this long. I think they have these statements pre-recorded. feels like the entire event was pre-recorded.Turns out the shooter had millions in the bank. He engaged at a distance of 400 meters from two windows on the 32nd floor. Booked a two room suite.He had been in Vegas a while on this trip.Everything suggests pre-planning and positioning from the cameras to the weapon selection. The gunfire heard on recordings has a dwell in the ROF Rate of fire. He might of found some of those old speed trigger kits from the 80s and 90s. Back during the Interarms Mac in A Sack days. ...The gunfire heard on recordings has a dwell in the ROF Rate of fire. He might of found some of those old speed trigger kits from the 80s and 90s. Back during the Interarms Mac in A Sack days. That's possible. I still say it sounded more like an AK variant than an AR one, but I suppose those trigger kits could account for that. It didn't sound like an AR, but that's what they're reporting he used. Latest Report, 23 Guns in room, 19 more in home. Does anybody find it hard to believe that one guy with no military background could shoot damn near 600 people from 32 floors up? Even if with automatic weapons and a high rate of fire and granted a target rich environment, how many rounds would have to be fired to get 500-600 hits on target? Even with a fifty percent hit rate he would have to have shot 1200 rounds. That is a shitload of shooting by one guy in a short amount of time and extremely accurate automatic fire. This whole damn thing is a setup. Either a mkultra mind control operative or he was a recent Muslim convert. Or maybe more likely this man was never the shooter. Always the same, he was a nice guy, normal, never saw this coming. Most likely many of the wounded were hit by bullet fragments, rather than a direct hit. I would imagine a few more were injured during the panic to get out of there. With a packed crowd like that, and several minutes of shooting, I think the number of casualties is realistic. But I agree, a lot of this just doesn't compute. If anything, this reminds me of the Texas clock tower shooting, where it turned out Charles Whitman had a brain tumor. Whitman went up the clock tower with a bunch of weapons and ammo, and no plan to survive the shootings. The article posted by 30 solder raises many valid questions. Alex Jones, Mike savage and others have been questioning the official narrative all day. Too many conflicting accounts of what transpired. Several victims and eye witnesses stated that gun fire / muzzle flashes were coming from multiple locations at the same time. Also several people reported that a woman went around the crowd yelling "your all gonna die" 45 minutes before the shooting began. Then there is the story of a concert goer who was warning people before the shooting that they were all �going to die.� Who is she? Is she involved? And, at least one news source said that the shooter did NOT commit suicide... "an FBI HRT breached the door and took out the gunman". The shooter engaged the cops and hotel security by shooting through the door. When they breached he was dead. My bet is, returned fire killed him. 30 Soldier the BG had spent time in the middle east and Philippines earlier this year.He had been in the Mandalay since last Thursday prepping the room. He had bump fire stocks from that slide fire company. the po-po is holding tite on much more info they do not want to compromise the investigation but more are involved. pretty soon Mothers Against Drunk Driving will probably as well. we will know more in the coming days or more will be hidden from us. First there was reported three shooters and then confirmed to be two active shooters. 34:40..... a white RV , older white male in black fatigues with a black bag ran into the motor home. 35:09 ....the older white male was witnessed coming from the area of the shooting and going into the RV. 44:50.... confirming the two shooting locations of Mandalay Bay and Ali Babba is there a third ? 13:48.....Active shooter at the Tropicana. 25:09..... room secure, one suspect down, multiple firearms, this was definitely the guy that was firing down into the crowds. 25:44.... any update on the "POSSIBLE DEVICE at the LEXZOR " ? 37:20.....One suspect down and in custody. 40:48.... armed man with a rifle walking into Valagio. 46:00.... citizen winessed a man with a rifle exit a white dually pickup truck and run down the road, also described as wearing a leg holster. 51:13...... white male with black t-shirt going into casinos with rifle and clearing everyone out, could be the one responsible for all this pandamonium. And then it just starts replaying from Number One. A guy on my team just went to Vegas today with his wife for their anniversary. He told me he talked to a Lyft driver who says there was most definitely a second shooter. The media has already figured out the problem. It's that "scrap of paper" Trump and all those Christians worship. And rapper "Lib B" says it's white peoples fault. I tried my best to give the highlights and the time stamps to go with them so that others could find them quickly, but since I was fighting to stay awake (prescription meds) I might have missed a thing or two. Sorry, I tried my best there guys. The BBC is reporting that now, too. That slide fire system always seemed a little Mickey Mouse to me, but I suppose if you practice with it enough, it'll work. Here\'s some photos and a video of someone, purportedly Stephen Paddock, at an anti-Trump rally. You be the judge. I have a crime scene photo. Not sure if I should post it.Its pretty gruesome. It looks like he ate a snub nosed 38. I have that photo as well. Dirtbag was worth worth $2-12m, sent $100k to the Philippines�, owns 3-4 houses and apparently 42 guns, 2 airplanes, and was gambling $10-30k per table in the days up to the shooting, in a place that he booked months earlier, which happened to have the PERFECT angle on the upcoming venue which was unrelated AFAIK to the nearest place he could have owed money to. good deeds done for the day cut up trees for the community as the wind blew them over in some back yards. A caller to the Michael Savage radio show who says he was neighbors with Las Vegas gunman Stephen Paddock asserts that Paddock could not have carried out the massacre and that it was actually a �set-up�. I think the key to this, is to find out why he targeted that country music festival. It was clearly no accident, he deliberately chose it. I hate rap music, but I'm not going to shoot up a rap concert. I'm beginning to think this is another Charles Whitman. He just wanted to shoot a lot of people, and chose a music festival. If it was political, I can think of a few hundred targets that would be more appropriate.